Is there a question you think should be here that we missed? Ask it in the comments at the bottom of the page! These are things useful for all amateur radio operators — currently licensed, previously licensed, or aspiring. What is an FCC Registration Number and how do I get one? An FCC Registration Number is a number assigned to you by the FCC which can be used with all FCC transactions (including applying for a new call sign, renewing your existing one, etc) in place of your social security number. Read more here. How do I update or renew my license? You can renew your Amateur Radio license on the FCC website completely free! Read more here for instructions and screenshots to see how it works. Where do the question pools come from? The question pools are written by the Question Pool Committee (QPC) from the National Conference of Volunteer Examiner Coordinators. Many people seem to be under the impression that the question pools are published by the FCC or the ARRL. This is not the case, though the ARRL is likely part of the NCVEC and thus involved in the process. The original documents can be found here. If you would like to write something using the question pools, we have them in json and xml format and will make them available to you on request, just send us an email. Update: As of May, 2018 we do! You can always use hamstudy.org in your mobile browser, but for those users who want to use HamStudy.org without an internet connection we have offline-capable apps for most mobile and desktop platforms! We do ask $3.99 for the offline capable app, but keep in mind this includes all question pools and explanations from the website! Also, if that’s too much for you we still welcome you to use the online website for free! Can I reset my stats / progress on the site? 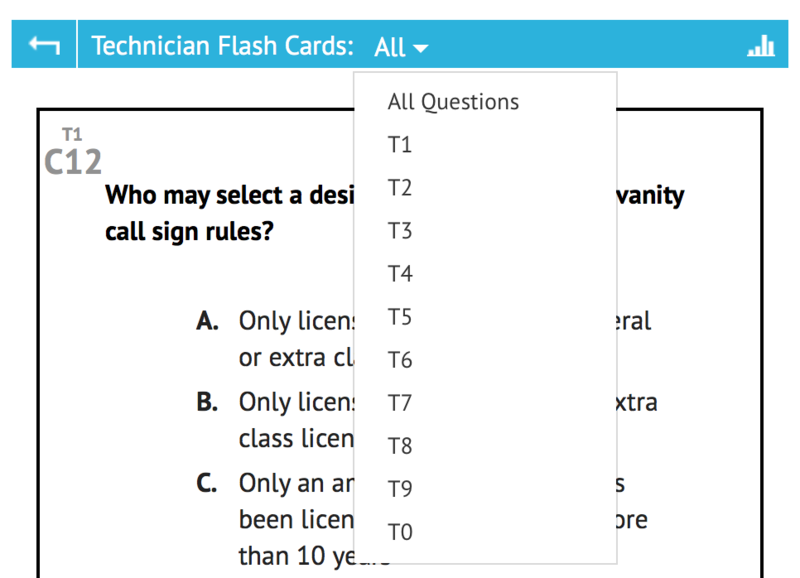 See the next question for how questions are chosen for the flashcards, but this is not needed. If you keep going through the flashcards, it will keep giving you the questions you need. You will see all the questions again, even if you answered it correctly the first time. Will I get any questions on my exam that I don’t see while studying on HamStudy.org? It depends on how you study. The question pools are publicly available — you can download them online for free. This means that any competently developed study program for Amateur Radio has the potential to give you all possible questions. Where things get tricky, though, is that far too many people rely solely on practice exams to study. Even with HamStudy.org this will not guarantee that you see all the questions. A well-designed practice exam is exactly what it says — an exam generated exactly like a real exam would be. HamStudy.org’s practice tests work just this way. What this means, though, is that even if you take 30 practice exams you may not see all of the questions! We at HamStudy.org consider this to be a Bad Thing. Therefore, we created the flashcards. See the next question for exactly how they work, but if you use the flashcards correctly you will see every question in the pool — not just see, but learn, as the ones that you need will be repeated for you. You can also look at the charts to see how much of the pool you have seen and which areas you need to work on the most. How do the flashcards work? How are questions chosen? What percentage of people answered this question correctly the first time they saw it. 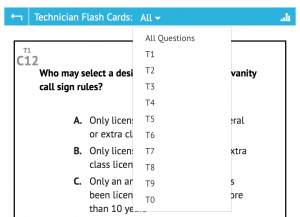 The flashcards use a sliding scale to determine which “rank” of question to choose next. This sliding scale attempts to balance easy/review questions and hard/challenging questions in such a way that it keeps you challenged but not too frustrated to continue. Can I narrow down my FlashCard studies? You sure can! At the top of the flashcard screen you will see “Technician Flash Cards: All”. (Of course, the pool name will vary). Here is the trick that some people miss: The “All” is a dropdown! Simply select the subelement you want to study and you’re there! You can also click on a subelement on the chart showing how many you missed after taking a practice test. What does 100% aptitude mean? Overall aptitude is defined as the average aptitude for the group of questions under consideration. Aptitude for a given question is determined using a logrithmic scale where the most recent time you answered the question is worth 50%, the next most recent 25%, then 12.5%, etc up to the last 10 times you have seen the question. When you haven’t seen the question 10 times, the number is estimated based on the percentage of people who answer that question correctly the first time they see it. How can I best use the resources on HamStudy.org? Use practice tests as a progress gauge, not as a study tool. When you finish the test you can see where you missed the most questions, so focus on that subelement for awhile. Rinse and repeat. Don’t underestimate how useful reading the questions can be! That’s why we have the section there, and you can click “Hide Distractors” in the top right corner to hide all but the correct answer. Flash cards can get tedious after awhile; break the monotony by reading questions and taking a practice exam now and again. It can also help to select a specific subelement to study. Whatever method you choose, the most important thing is to not get discouraged and keep going! I thank you for the effort that goes into this great study tool. I plan on taking my General this week and should have no problem passing it. One suggestion for future consideration, would be to have the order of the answer change or be random. Each of the distractors as well as the correct answer would be there but not always in the same order. I’ve been studying here for two days, this is awesome! I am quite confident I will pass my upcoming test. I have to wait 3 more weeks until there is one available, so I will continue to study till then. Thanks for putting this site up. It is very much appreciated!! Love your flashcards! Makes the learning and review fast and easy. I’m an American living in Rome, Italy for a year or two or three. Can’t go on the air here without at least an “Extra” so I need to upgrade my Technician! If it’s possible to take the USA exams here in Italy, like maybe at the American Embassy, where can I find that information? Honestly I have no idea; my guess would be that there is no way to take the exams overseas unless there happens to be a VE team over there. The VECs have been trying to come up with a good way to do remote testing, but given that the question pools are open it’s far too easy to cheat. It’s a tough problem, and nobody has a solution that I’ve heard so far. I’m a retired U.S. Foreign Service (Communications) Officer. Several of my colleagues have HAM operator licenses from Tech – Extra. In order to operate ANY broadcast radio or station, regardless of output power or operating frequency, the individual or organization MUST be granted ‘permission to operate’ (PTO) by the host nation. This also applies to foreign embassies for permanent, temporary, and one-time use. Depending on the level of sophistication applied by the host nation’s ‘security service’ (which in most cases has oversight of ALL in-country telecomms), being granted PTO is a long, laborious and very convoluted process for locals, (even diplomatic missions), much less ex- pats, non-citizens and so on. PTO on desired freq’s is rarely granted and may be revoked, without notice, at any time. For information on using a US ham license in many countries, see: http://www.arrl.org/us-amateurs-operating-overseas. This is a very useful document and can get you on the air fairly quickly (usually, esp. depending on what your license class is — as one gentleman in Italy mentioned, you need to have a US Extra Amateur now to operate at all). Last month I passed the General with a 100% , This month I passed the Extra with a 100% again, both times by only using your site. If it helps anyone else, I read through the questions copying down all the math formulas, then while using the flash cards, every time a math problem came up I used the formulas to find the answer till I no longer needed to look at my notes. I did this even if I remembered the answer from the last time, so these formulas would be ingrained into my head. Exam time I was able to remember all the formulas for the test. Thank you HamStudy.org, I have been recommending your site to everyone interested in getting a license. Okay, I’ll give it a shot. I want to earn my Technician license and this seems like a good way to go about learning and studying. Thanks to hamstudy.org, I passed the Technician and General exams. The interactive flash cards are brilliant! Not only do they show the correct answers, they give the theory behind those answers. They not only taught, but gave me the confidence to take the exams with an “I can pass” attitude. Thanks for your commitment and effort in putting the best ham study resource on the web. Thanks for your kind words! Please remember that the explanations are provided and maintained by users like you, so if you find them useful please consider helping by updating them or by filling in some of the missing ones! Love the website and flash cards, but having trouble right now. I’m about halfway through studying for the Technician License and can’t get flashcards to load tonight using Chrome or Safari (on a Mac). Had this happen the other day too. Is there something I need to look into or change on my computer, or is the site having issues? Thanks for your help! Comments on the blog site aren’t a very effective way to request support; if you’re still having trouble, we recommend to email us with specific details at support@hamstudy.org. Please note that if you don’t tell us exactly what is happening it’s hard for us to assist; for example, instead of emailing us to say “I can’t get flashcards to load” tell us exactly what you see when you try to make them load. 90% of the time when we get support requests we have to email back a request for more information before we can even understand what problem is being reported. Do you have any of those antennas left for the baofeng radios. The fexlible ones you can put into a know sort of speak? In order to avoid conflicts of interest with HamStudy sponsors, HamStudy.org does not produce or sell any equipment. That said, one of our sponsors, Signal Stuff, makes and sells flexible antennas which look amazingly similar to the ones we had and donates all of the profits to HamStudy.org. Love the flash cards though, two of the example schematics didn’t load along with the questions. Will still be using it till the morning of the test. If it happens again could you email us at support@hamstudy.org and let us know which questions had the issue? I’ll look into it. Thank you so much for what you do! Before I found this website I was overwhelmed with all of the complex math, questions, and data. Because of this website (and a few helpful ebooks on the internet) I passed my Technician test yesterday, and hope to work on General soon! Do the flashcards contain the full list of questions that might appear on the test exactly as they would appear on the test? Yes. The answer order will be shuffled since some exams shuffle them, but otherwise it is exactly the same word for word. You’re very welcome — best wishes and good luck on your studies! Thank you so much for providing this invaluable resource to the ham radio community. As someone very new to the hobby it was incredible to find this kind of study support. My time was well spent here as it helped me be able to pass all three exams. I really love that you include the additional information going into detail about the correct answers. It’s our pleasure! Note that the explanations you’re thanking us for were actually provided by other users like you! This resource saved me! I wanted to get my Extra ticket before the change. The ARRL book was of little help. Thankfully, I found this site last Monday, and with a couple hours of work each over 3 days, I was able to pass (just barely, but a pass is a pass) the exam today. There’s just douche stuff in the Extra exam that 1) I do not care about and 2) I will never use, I was almost to the point where I was convinced it was little more than a self-inflicted hazing. The flash cards, however, gave me a way ahead and a great way to organize my studying and learning. So, many thanks. ABSOLUTELY NOTHING, I repeat, NOTHING happens…just keeps looping back over and over again!!!!!!!!! Very, very, very frustrating!! What gives? Usually when people experience this issue it’s because they’ve registered more than one time; when you do this, only the last confirmation code that was sent will work. If you’re having trouble with this, email support@hamstudy.org and we’ll help you on a case by case basis. We will be working to improve on this in the new version which is under development. I started using this site at the beginning of the month and I just passed my technician license! Thank you so much this is a great study tool. I have a question, I am waiting for my FCC license but I plan to take the General license test in one month. Will my FCC license number change when I get the next level? Congratulations on your new license! Your FCC Registration Number will always remain the same; you can request a new call sign when you fill out your Form 605 for the upgrade, but otherwise your call sign will remain the same. I wouldn’t worry about changing it for General, but you could try when you go for Extra if you want; alternately you could get a vanity call sign. Shipping is $2 for the first antenna, $0.50 more for each additional, and free for orders over $50. Great website! I was wondering, If you fail the test, do you still have to pay the $15? or only if you pass, then you pay. The fee is for taking the test, not for having the license issued, so you pay whether you pass or not. If you pass, most VE groups will let you try the next one for free; as long as you keep passing tests you can keep taking them =] Once you fail you have to pay again if you want to retake the exam. Some groups will let you keep trying as many times as you are willing to pay for and some don’t. Not all VECs charge the same amount, also; ARRL is $15, but W5YI is $14, GLAARG is $5 (I think), and Laurel is free. These are rules of thumb only; there could be exceptions with specific groups. Passed all my tests using your Hamstudy.org materials on my iPhone. It worked perfectly. I recommend it to everyone who asks me. This is an excellent tool. Reading all the questions first is a key. Then do the flash cards a group at a time and then finally all of them and then the tests. I also ordered several of the antennas. They are perfect on the little Chinese radios. They are lightweight and tough. Just wanted to say how much I appreciated all the materials and your hard work on this app. Hello, I have been visiting many pages of study for amateur exam, and this is the one found excellent, Thank you very much. I want to thank this site and all that run this site . I started here 12/2015 I think , and passed my teck. and the general and on 12/22/2016 , I took and passed the extra test .All from studying on this site . !!!!!!!!!!!!!!! Many Many Thanks for Ham Study. Returning to amateur radio after 28 years away, reviewed the Tech/Gen question for 1 hour each evening for two weeks. Took my exams the Sunday following passed both with 100%!! Painless even Fun and Awesomely effective! Now working on my Extra class. This time going to a give it a two month study period. Fingers crossed. Thanks Again! Just wanted to let you know that I took the Technician written test this morning. Passed with flying colors and only missed one question. Your site is the best use of flash cards that I’ve ever seen. I didn’t know anything about ham radio, but the flash cards are so much fun, I’ve got 84/100 technician in less than two days and am interested to learn more. I just stumbled across your site. I’m very impressed by the explanation functionality. Where is the best place to make suggestions for this site? Can you make a link to the explanation more direct for people using screen readers? The visual pull down in the corner with the ‘I’ information icon looks great for sighted people, but is challenging for those without sight. Usually the best way to make suggestions is to email support at the website domain, but this works. We are working on a new layout for the website and I will absolutely keep that suggestion in mind; I hadn’t considered how a screen reader would deal with the explanation button. Thanks for the feedback! I have a fairly captive audience where I work, so when I talk about my job and ways to enjoy it to junior members I ALWAYS recommend this site for those interested in amateur radio. I was crunched for time but otherwise would have breezed through my extra; I finished with my general. Thank you for maintaining this awesome tool. Very happy to be able to help! Congrats on your extra! Question: I have a FCC General Radio Operator License GROL with RADAR endorsement since 2001. Is HAM radio privileges and limitations covered under the GROL certification? I’m into RC Flying and transitioning into FPV flying that requires to have a HAM Radio License to be legal. Please any help to this question is greatly appreciated. No form of commercial radio endorsement from the FCC conveys any privileges to amateur radio frequencies; the only way to gain access to the amateur radio service is to take an amateur radio license exam. Invaluable study tool. I used Ham Study.org for both my General and most recently my Extra exam in addition to the ARRL Extra Class License Manual. The latter two are a must for the Amatuer Extra exam, it is not easy. I spent 3 months preparing for it and passed with a 92%. I signed up for an exam through hamstudy.org and studied hard in the prior weeks only to show up and find out the exam had been rescheduled for earlier that day. I contacted the volunteer who ran the session and they said they updated the information and hamstudy.org should have let me know about the change. I was never notified of the change. Another guy showed up at the originally scheduled time and was not notified of the change either. I am very upset that the next available test in my area is several weeks away. I feel like my studies the last two weeks were a complete waste. Ultimately, I am wondering how I can sign up for a test and ensure that change notifications get to me. This cannot happen again. That sounds like an extremely frustrating evening and I can only offer my sincerest apologies. I hoped to have it done before answering you as an apology, but I have it only about half complete still and I have already waited too long to respond to you. I am so new at this. I do not understand much anything. Is there somewhere I can get definitions of everything. Need help? It can be a little overwhelming! There are a number of free resources available as well as some paid resources which you can try. See our Links page for some ideas! Terrific website! Can you take the Technician, General and Extra exams all in the same day? Thanks!!! Absolutely! The only limitations would be if the group running the exam session is not prepared to offer all three. In fact, most of the time if you pay for the first you can keep testing without paying again until you have passed all of them! We call that a “triple play” =] At our test session in Provo, UT I see it maybe 2-3 times per year (which is less than 1% of all applicants). How do I change the email address on my profile? Thanks guys for such an outstanding resource to help us study for our Ham exams! I took and passed my Technician Class exam last night here in Mesa, AZ. Now, as the saying goes, I’m licensed to learn! Our classes were offered for free by a great, personable, and knowledgeable instructor, who, with a helper, even programmed students’ radios with over 50 local frequencies! Now, I might even be brave enough to study and test for General and Extra, join ARRL, and a local ham club! Since I’m an ol’ retired hermit on Social Security, I don’t have much in the way of financial resources, but maybe I can find an Elmer [or a cute Emma], who will steer me to a good source for affordable and reliable antennas, base stations, and mobile equipment for my 32-year old, shiny Camry [do these things ever die?]! I might even try again to learn Morse Code, for grins and giggles! I’m sorry to ask this question here but I can’t find out how to contact HamStudy.org. So, my ? is in the NEW study guide for 2018 in question number 3 asks…..
What are the FCC rules regarding the use of a phonetic alphabet for station identification in the Amateur Radio Service? and the answer is D.
I’m sorry but I don’t get it. Is this a typo?? or is that the real question? All of the questions are real, yes =] They are maintained by the NCVEC (ncvec.org) so everyone uses the same banks, these are not generated or maintained by us. Did you click the top right corner of the question and read the explanation? It looks fairly well written to me. Totally new to HAM and the idea of studying for a license! I wanted to ask, I noticed Technician, General, and Extra what separates those qualifications? meaning what are their differences. Also do you have to start with Tech and work up or can you study for Extra and only pass for Tech, or General? I am totally Blind using a screen reader (JFW) so may have over-sighted the information on the site. I have been told that the website works decently well with a screen reader — if it doesn’t please let me know and I’ll see if there is anything we can do to help. In order to qualify for Extra you must have passed all three elements: Element 2 (Technician), Element 3 (General), and Element 4 (Extra). To qualify for Technician you just need element 2, for general you need element 2 and element 3, etc. If you’re wondering about the numbering, Element 1 used to be Morse Code but is of course no longer required. Thank you so much for your time making this site and the app. I started refreshing my memory using your website and the app and I was able to pass the General exam today. Honestly, I studied only around 3 weeks and missed only one question in my test. I highly recommend to anyone to use this website or the app to pass your HAM test. Thank you so much for all the thought and work that has gone into this site. I am just beginning my studies, but I have been warned to make sure I am studying for the new test that came out July 1st 2018. Is this site directed toward that test? Great site Passed Elements 2 & 3 today, never operated a radio apart from CB in my life, just bought a BF-F9 V2+… Thanks. Your site looks great! However, I have a question. When I tried to register using my call-sign, I received a message saying my username was already in use. I don’t remember ever registering with HamStudy previously. How can I verify that no one else is using my call-sign for a username? I can find no Contact Us or other means of making contact with HamStudy personnel. Feel free to delete this post, after answering my question, as it really doesn’t pertain to studying for a license. You can reset your password by going to https://hamstudy.org/reset and putting in the username; if it says the username is in use but you don’t get an email then it’s a good sign someone else is using it. Email us at support@hamstudy.org and we’ll see what we can tell you. Hi, You mentioned that all these pool questions will be word for word on the actual exam. My question is, can I straight up just memorize the mathematical answers instead of learning how to calculate it? Yes, that is 100% possible.